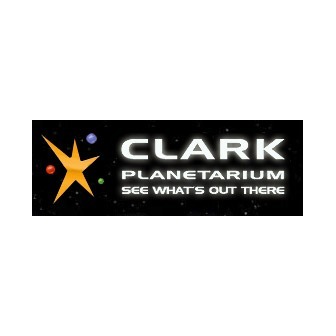 Clark Planetarium's space exploration-themed building is a unique and spacious facility capable of entertaining up to 800 guests. With the ATK 3D IMAX ® Theatre, Hansen Dome Theatre, classroom and 10,000 square feet of exhibits, the planetarium is the very best. 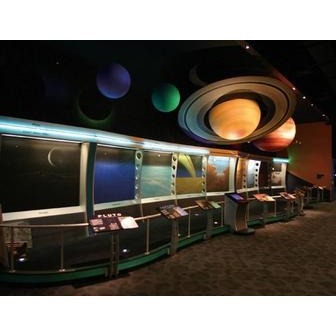 With a membership to Clark Planetarium, the universe is at your fingertips. Members receive free access to most documentary shows in both theaters, discounts for other programs and invitations to exclusive member events. 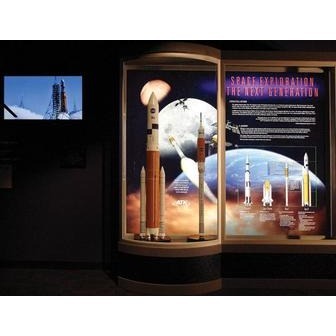 Listed below are some of the various exhibits at the Clark Planetarium in Salt Lake City, Utah. Our 5-story high IMAX 3D screen extends beyond your imagination, engulfing you with jaw-dropping 3D images and spine tingling 14,000-watt digital sound. Enjoy 360-degrees of immersive entertainment that offers a sensory experience unlike any other. 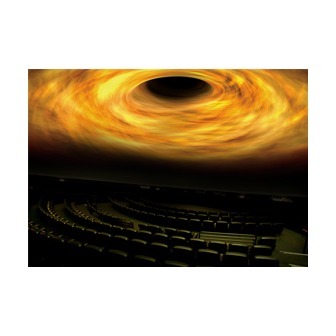 With 3D computer animation and digital projection, this domed theatre lets you explore the universe in ways you wouldn't have thought possible. With a state-of-the-art projection system and 13,000 watts of digital surround sound, our cosmic light shows will rock your world... and maybe a few nearby planets. Does the Earth really turn? This classic demonstration was the first real proof that it is the Earth that spins, and not the sky. NASA's Space Shuttles have served us well for almost 30 years and are now approaching retirement. Soon, a new generation of Ares rockets will take over the task of launching 21st Century astronauts and cargo into Earth orbit, to the Moon and to Mars. 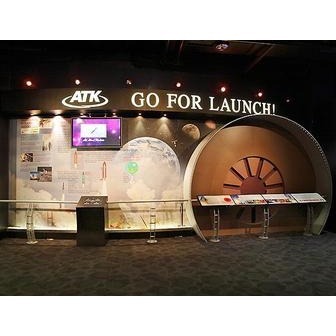 This new Project Constellation exhibit from ATK Launch Systems showcases the Ares I Crew Launch and Ares V Cargo Launch vehicles in scale models and includes computer animation of how the system will support America's efforts to return astronauts to the Moon in the next decade. How do telescopes work? Which one is right for me? 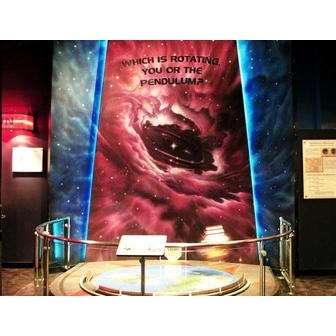 This interactive exhibits will help you understand the tool of the astronomer, and get you started on your own observing hobby. Our classic Rand McNally Earth Globe, which is on the 3rd level. 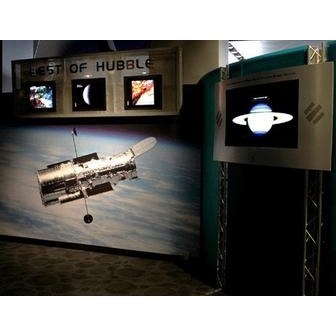 See the "Best of Hubble", spectacular images from the Hubble Space Telescope. Also watch a weekly-updated program of current events in Astronomy and Space Exploration. 200 miles above the Earth, the largest and most complex space laboratory ever built continues to grow. Continuously inhabited since November, 1997, the scientists aboard the ISS strive to learn more about space, science, and the human body and mind. 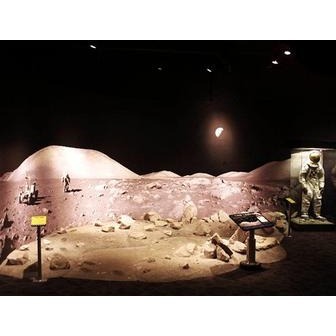 Would you like to go to Mars one day? Our MarsScape will certainly help tomorrow's astronauts imagine standing on the Red Planet. A very nice collection of meteorites representing many different sizes, shapes and classification of these rocks from space. 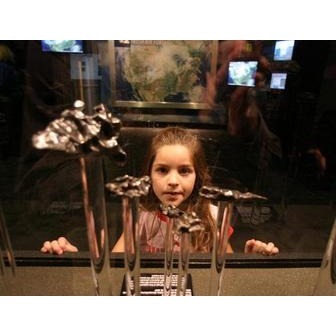 You'll be surprised at how heavy meteorites can be as you touch, hold, and lift actual meteorites. 12 astronauts walked on the Moon. Thousands have imagined their own moonwalk on our MoonScape. 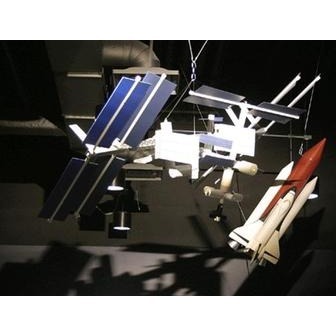 "Newton's Daydream," an audio-kinetic sculpture by renowned artist and sculptor George Rhoads, is the newest permanent exhibit at the Clark Planetarium. The two-story tall sculpture combines an intricate maze of moving balls with bells, drums and other noise making obstacles to create a whirring visual and auditory palette. "Newton's Daydream" is installed inside the Planetarium's main lobby and will be the focal point for all visitors. Why is the Sun so low in the sky in winter? Why are the days so long in summer? 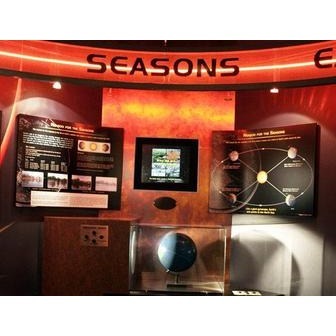 This interactive exhibit won't lower your air conditioning bill, but it will help you understand why we have seasons. 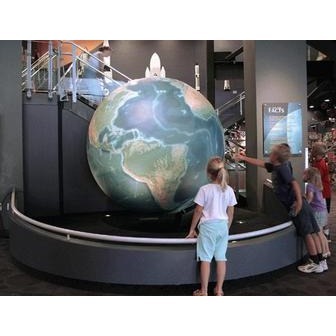 Clark Planetarium's newest showcase exhibit, Science On a Sphere (SOS)®, fills the lobby with a global display system. Science on a Sphere uses advance computing systems to project a multitude of video sequences onto a six foot diameter sphere. Image sets include Earth's weather systems, plate tectonics, ocean temperatures and Earth at night. Also presented are the Milky Way, Sun, Moon and the other planets of our Solar System. Future enhancements will include narrated programs and live demonstrations. What causes eclipses? 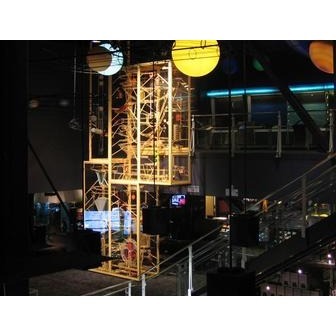 This interactive exhibit will prepare you to see and understand one of nature's greatest phenomena. Are you curious about the new solar panels on the roof of Clark Planetarium? Come explore our new exhibit, Star Power. Find out how much power you can produce with your muscles, how solar panels work and how most of energy sources we're familiar with have their ultimate origins in sunlight. See an actual Moon sample, returned by the astronauts of Apollo 15. 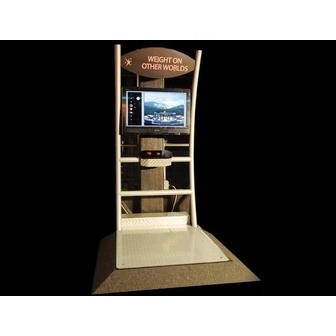 This highly informative exhibit will help you better understand our companion world and humankind's journey there. Clark Planetarium's model of the Solar System is 150 million times smaller than the real thing. Even at this scale, the Sun is so large it cannot be contained fully within the exhibit space! 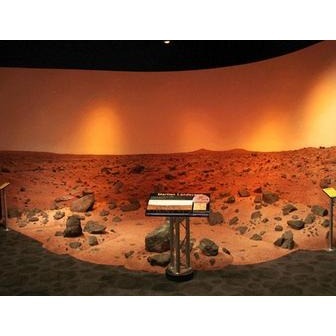 This exhibit has interesting facts about each planet and a computerized quiz that allows you to test your knowledge of the solar system. How much would you weigh if you were standing on Mars? How about on an asteroid, or a Neutron Star, or hovering in a spaceship above the clouds of Jupiter? Weight on Other Worlds will tell you. This great interactive exhibit will both educate and entertain as you watch a computer-animated space alien explore the physical conditions on thirteen different worlds. Notes: Clark Planetarium’s lobby, exhibits and store open at 10:30 am 363 days a year. We close following the start of the last theatre program of the evening. The Hansen Dome Theatre, exhibit halls and store are closed on Thanksgiving Day and Christmas Day, and close early on Christmas Eve; regular schedules apply on New Year’s Eve and other holidays. In general, the last show in the Hansen Dome begins at 6:45 pm Sunday 9:00 pm Monday-Wednesday 10:00 pm Thursday 11:00 pm Friday & Saturday The ATK IMAX Theatre is open 365 days a year. The last show of the evening is usually scheduled around 10:00 pm. 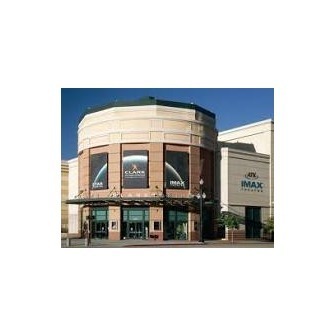 On Thanksgiving and Christmas Day, please access the IMAX Theatre from the Megaplex 12 at the Gateway lobby. We try and go to the Clark Planetarium at least once a year. It's an enjoyable place to visit for both adults and children. 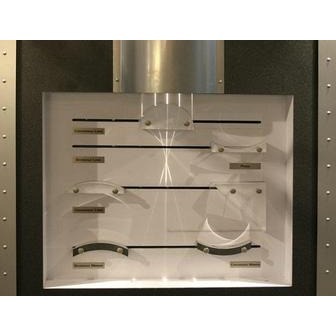 My favorite exhibit is the Newton's Daydream, which is sort of like a Rube Goldberg machine where little steel balls move around and make their way through a maze of obstacles. I've literally watched it for over an hour before. It's fascinating. They have many different shows including educational IMAX films, space films in their dome theater, and also light shows for bands like Pink Floyd.